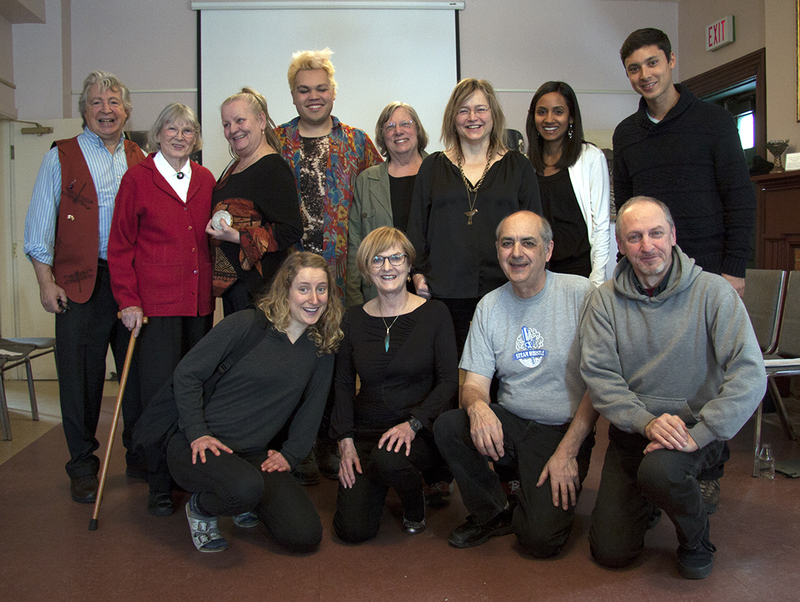 On Sunday March 1, a cast of nine performed ‘C’mon Granny’ to a full house at Lambton House in Toronto: Joy, Riva, Jeannette, Mike, Paivi, Aurora, Amelie, Cody, and Luc assumed their roles – and welcomed all of the audience members to participate in their dialogue. The story leaves the audience in a moment of angst, wondering what could have been done to change the sequence of events—to render it positive. The facilitator, Simon Malbogat, catalyzed the audience to identify the underlying issues, respectfully asking: What are the problems with this scene? What would you do differently? When a nine-year-old audience member volunteered her answer, “I would ask that someone give the Granny a seat,” Simon asked her to, “Show us what that would look like.” The cast members reenacted the scene of Lucille searching for a seat, and the young girl politely interjected, “Excuse me, there’s a lady here that needs a seat.” The person sitting in the seat displayed embarrassment and immediately got up to give Lucille the seat. The young girl illustrated the importance of the “upstander” – a person who recognizes the victimization of others and chooses to act on their behalf. Simon continued to encourage the audience to analyze these moments of oppression by identifying the implications of not helping a vulnerable, elderly person. Audience members, engaged in the pursuit to facilitate change, offered alternative options: challenging the thief, seeking support, and questioning the granddaughter’s disrespectful behaviour, with or without a third-party perspective. Collectively, the audience, moved by the scenes of injustice, identified different options for handling these conflicts: positive and constructive behaviours that changed the outcome and challenged the mistreatment of seniors. The next step in the InterGEN project is the Youth workshop, which will take place during March Break (March 16-20). When the youth create their script, based on what it’s like to be a teen in Toronto, the seniors will be on scene: On March 20th, both groups will perform for each other—and all will have the opportunity to participate in creating options to challenge oppression, by identifying alternative options to resolve conflict. Stay tuned for more updates from the set! This post was contributed by: Christina Parker (OCT, Ph.D.), an educator and researcher in Toronto and MCT’s Volunteer Researcher for the Inter-Gen program.